The international news media, after a long period of time, had commenced publication of details of the gory killings by the Army and their paramilitary groups in the Northeast. The Sri Lanka Monitoring Mission (SLMM) had finally come out openly against the Government, accusing it of covering up atrocities by the Army and the paramiltaries. International human right organizations like Amnesty International, have begun to question the Government of Sri Lanka. This certainly had stung the Sinhalese nationalists to some extent. What stung them most was the fact that the European Union and Japan, who are major donors, had passed strictures on the Government to the extent of threatening to cut off aid. This was the final straw. The extremists had to do something and, that too quick, to divert the focus of the European Union and Japan elsewhere. The result was the Kebethigollewa carnage. The news of a senseless attack on a civilian bus carrying more than 150 persons in Kebithigollewa in 15th June, 2006 was received in Sri Lanka with shock and grief. 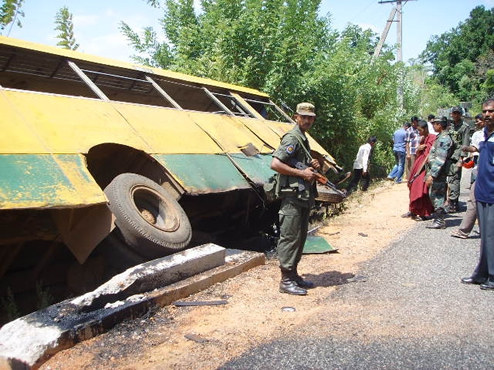 Details emerged that a Claymore mine atack on a bus carrying Sinhalese civilians was carried out in mid morning, leaving 64 Sinhalese civilians dead, including 12 children, and 75 injured. News wires buzzed around the world. The Government of Sri Lanka immediately blamed the LTTE for the barbaric and senseless violence. The international community, led by the United States, similarly followed the Sri Lankan Government's condemnation. 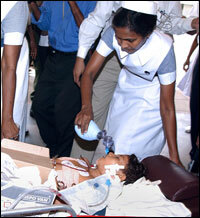 Their line of thinking was that, for all intents and purposes, the LTTE was behind this barbaric and senseless attack. To begin with, Kebithigollewa is a Sinhalese village situated 23 miles south-east of Vavuniya, on the Vavuniya - Horawapatana road, but situated in the Anuradhapura District, a predominantly Sinhalese district. To be precise, this village is situated 15 miles in the interior of Anuradhapura District from the Vavuniya District border. As stated earlier, it is situationed on the Vavuniya - Horawapathana road, where there are several Sinhalese hamlets on either side of the road before the road reaches Horawapathana, a small Sinhalese town. Close to these hamlets the Sri Lankan Army had set up bunkers on both sides of the road from the Vavuniya border for the purpose of security, which is being provided by the Army as well as the police, with a telephone link to each other. In addition to these security measures, the Sri Lankan Army had recruited men from these hamlets and provided them with firearms and firearms training and appointed them as Homeguards. Not only are the Sinhalese Homeguards on the watch on the road, but the Army also patrols the road often. Routinely, the Army carries out roadside checks every morning, especially for mines, since the Army itself often travels down the road. On the morning of 15th June, 2006, the Army as usual had carried out the roadside check for mines before 9:00 am and moved on. On 15th June, 2006, a large number of people had gathered in Kebethigollewa to attend the funeral of a homeguard from Kachchakodiya village, located a few miles from Kebethigollewa. The writer is able to gather the fact that this Homeguard had strayed into Tamil territory for intelligence work for the army and had been detected by LTTE cadres, which led to his death. The attack on the bus occurred 5 miles from Kebethigollewa inside a 100% Sinhalese territory around 9:45 am, forty-five minutes after the Army had completed the roadside security checks for mines. The Government of Sri Lanka provided a fleet of helicopters to news reporters, cameramen, television crews, etc. for them to get to the site of the attack and get the news and gory pictures on television screens and in the media in double quick time. The President himself flew in to Anuradhapura and then traveled by road to the Hospital to see the victims, where he was greeted with an angry reception from the families of the victims. Despite advice, he visited Kebethigollewa, where he was not only treated to an angry reception, but tires were burnt on the road and around the Town area as acts of protest against his visit. 1. On the 15th of June, 2006 it was the Sri Lankan Army, together with the Sinhalese Homeguards who organized the trip to attend the funeral. Two buses were made ready for the people to go to Kachchakodiya to attend the funeral. One bus broke down, while the other one moved towards Kachchakodiya. After the attack, the Army not only showed the reporters the site of the attacks, but also the unexploded second mine. In short, there were two claymore mines for the two buses to get the maximum out of the carnage, but it was not to be. Who had the best possible opportunity to get to know that two buses were being hired for the trip to attend the funeral? 2. Setting up a claymore mine on the roadside is no easy task. It takes time and patience. It can never be done in a hurry or it could blow up in one's face. After the routine morning roadside check by the Army which ended around 9:00 am, the bus with the unsuspecting passengers arrived at the spot at 9:45 am to its destiny, therefore giving just 45 minutes to plant the devices - mind you not one, but two, which needs at least four persons to accomplish. Is it possible for LTTE cadres, and that too Tamils, not to be seen in the daytime planting these devices on the roadside, deep inside a purely Sinhalese territory, with Army and police bunkers at regular intervals on either side of the road and Homeguards, too, within the short time span of 45 minutes? 3. An attack of this magnitude is a matter of deep concern to all right-thinking people. The Government of Sri Lanka, instead of sending dowm doctors, nurses and other medical personnel, together with drugs,dressings, antibiotics, etc. ferried personnel of the print and electronic media in helicopters to the site, to gain maximum publicity in the international press and, correspondingly, in the international community. Is this not suspect in the logical thinking of ordinary folks? 4. As stated earlier, the President was greeted with angry receptions by the family members, relatives and friends of the victims when he visited the Kebethigollewa Hospital. There were more angry receptions when he visited the site, where tires were burnt down the road knowing well the President was to visit the area. What was the reason the very Sinhalese, especially from the rural areas who voted for the President overwhelmingly, turned against him? 5. Consequent to a tragedy of this magnitude, is it not strange that the President, as his first priority, had ordered the bombing of civilian areas of the LTTE-controlled region of Kilinochchi, Mullaitivu and Trincomalee for three days, instead of getting his team to come to the bottom of the tragedy and support the families of the victims? The fact that two buses were hired for the trip was known only to the Army and Homeguards who organized the trip, and definitely not to the LTTE, who have no connections whatsoever with people in a 100% Sinhalese community. This was the reason for the Army to plant two devices and not one. It is well nigh impossible task for the LTTE to plant two mines using four persons and that too in broad daylight within the short span of 45 minutes, that is after the roadside check by the Army till the arrival of the bus carrying the people, in full view of the Army bunkers and the hamlets. The only people who could do it is the Army and definitely it could not be the LTTE. After the attack, in double quick time, it was the personnel of the media who were ferried to the site and to the hospital, so that the incident could be splashed to the international community, and NOT the medical personnel or the necessary drugs to attend the victims. Does it not look like a drama that was enacted to gain cheap publicity for political gain with the international community? The Army did this in double quick time. Is it not clearly evident that the Army was prepared beforehand for this event? The reason for the angry reactions and the tire-buring by the people of the area is that the people had come to know of the hand of the Government in this carnage. It is quite possible that the JVP, JHU and/or sections of the military organized this atrocity to achieve their political goals. There had been a clamour for outright War against the LTTE by the JVP and the JHU, as well as chauvinist elements of the Army, led by Army Commander Sarath Fonseka, the Defense Advisor Kotakadeniya and the likes for some time. These elements knew that, to force President Rajapakse's hand, something spectacular had to be done. Certainly, in the wake of the attack, the clamour for war from the Sinhalese extremists has become deafening, and the armed forces have seized on the incident to launch a series of air and artillery attacks on LTTE positions. The international news media, after a long period of time, had commenced publication of details of the gory killings by the Army and their paramilitary groups in the Northeast, where there was no compunction shown even where infants and children were concerned. The Sri Lanka Monitoring Mission (SLMM) had finally come out openly against the Government, accusing it of covering up atrocities by the Army and the paramiltaries. Considering the fact that the SLMM is composed of Europeans and not about to be partial to the one or the other party, the international human right organizations like Amnesty International, have begun to question the Government of Sri Lanka. This certainly had stung the Sinhalese nationalists to some extent.